Elaine of Astolat (/ˈæstlæt, -ɑːt/) is a figure in Arthurian legend who dies of her unrequited love for Sir Lancelot. Also referred to as Elaine the White and Elaine the Fair, she is the daughter of Bernard of Astolat. Versions of her story appear in Sir Thomas Malory's Le Morte d'Arthur and Alfred Lord Tennyson's Idylls of the King. 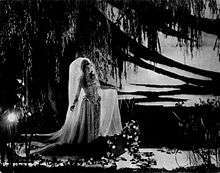 Elaine's story is also the inspiration for Tennyson's poem "The Lady of Shalott". 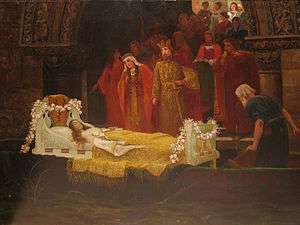 A version of the story appeared in the early 13th-century Mort Artu, in which the Demoiselle d’Escalot dies of unrequited love for Lancelot and drifts down a river to Camelot in a boat. Another version is told in the 13th-century Italian novella La Donna di Scalotta, (No. LXXXII in the collection Cento Novelle Antiche). Alfred, Lord Tennyson's poems, both titled "The Lady of Shalott", (1832 and 1842) were based on the story. The earlier version was likely referenced as the primary source material, and inspiration for the poetry, rather than the latter. Tennyson focused on the Lady's isolation in the tower and her decision to participate in the living world, two subjects not mentioned in Donna di Scalotta. In Malory's 15th-century Le Morte d'Arthur, Elaine's story begins when her father Bernard of Astolat organizes a jousting tournament, attended by King Arthur and his knights. While Sir Lancelot was not originally planning to attend, he is convinced otherwise and visits Bernard and his two sons before the tournament. While Lancelot is in her family's household, Elaine becomes enamoured of him and begs him to wear her token at the coming tournament. Explaining that Guinevere would be at the tournament, he consents to wear the token but says that he will have to fight in disguise so as not to be recognized. He asks Bernard if he can leave his recognizable shield with him and borrow another. Bernard agrees and lends him the plain-white shield of Sir Torre, Elaine's brother. Lancelot goes on to win the jousting tournament, still in disguise, fighting against King Arthur's party and beating forty of them in the tournament. He does, however, receive an injury to his side from Bors' lance, and is carried off the field by Elaine's other brother, Sir Lavaine, to the hermit Sir Baudwin's cave (Baudwin being a former knight of the Round Table himself). Elaine then urges her father to let her bring the wounded Lancelot to her chambers, where she nurses him. When Lancelot is well, he makes ready to leave, and offers to pay Elaine for her services; insulted, Elaine brings him his shield, which she had been guarding, and a wary Lancelot leaves the castle, never to return but now aware of her feelings for him. Ten days later, Elaine dies of heartbreak. Per her instructions, her body is placed in a small boat, clutching a lily in one hand, and her final letter in the other. 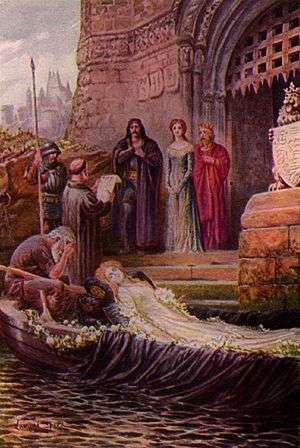 She then floats down the Thames to Camelot, where she is discovered by King Arthur's court, being called a little lily maiden. Lancelot is summoned and hears the contents of the letter, after which he explains what happened. Lancelot proceeds to pay for a rich funeral. ↑ "Astolat". Dictionary.com Unabridged. Random House. Retrieved 2016-01-21. ↑ L.S. Potwin, "The Source of Tennyson's The Lady of Shalott" Modern Language Notes, 17.8 (1902): 237-239. 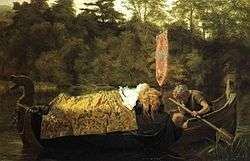 Wikimedia Commons has media related to The Lady of Shalott.